Proxes T1R. NEW ARRIVAL. Tire Type . High Performance All-Season. Passenger / Performance. NEW ARRIVAL. Car Type . 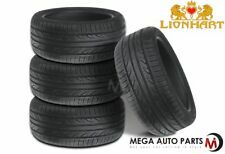 We put great effort into providing quality tires at a great price. All tires are pressure tested for leaks using our TI95 Tire Inspector and if present are professionally repaired using the Safety Seal Plug/Liquid patch system. The ultimate triple play, the SN250 combines exceptional traction, extended tread life, and quiet comfort. A well rounded, all-season touring tire, the SN250 boasts high mileage capabilities, comfort and handling. These are first quality tires and have never been mounted. The Kumho Ecsta tire features reinforced tread blocks for improved responsiveness, handling and braking. This reduces heat build for longer tread-life. The microgrooves are positioned on the diagonal to allow water to drain efficiently. The Goodyear Integrity has a long lasting and durable tread. This features a solid centerline rib that reduces noise and improves the tread life. This is a tough tire with high-tensile steel belts. TheSUMITOMO HTR A/S PO2 tire provides superior handling at high speeds and excellent wet and dry traction. It is ideal for sports coupes and luxury sporty touring cars. All the sizes of the Sumitomo HTR A/S PO2 tire have exceptionally crisp handling, long mileage, and a sporty ride to help you get the most out of your car. TheFirestone Firehawk GT tire provides excellent dry traction, wet grip, responsive handling and resistance to excessive heat due to high speed driving. The tire is best suited for full size rear wheel drive vehicles like the Chevy Camaro, Dodge Challenger and Ford Mustang. The perfect All-Season tire for any driver of mid-level sports cars, coupes, and high performance sedans, the Kumho Ecsta PA31 is designed with performance and safety in mind in both wet and dry conditions. The Snow Claws between the tread blocks grab snow and ice, enhancing grip and stability during braking and acceleration. If there is a rim shown in the picture it is for display purposes only. We have a knowledgeable staff that is happy to help. The Atrezzo SH406 is the latest all season performance tire from Sailun. Combining superior all weather handling, outstanding grip, enhanced durability and a smooth, quiet ride, at a good price, the SH406 represents excellent value. Also, the tread design is shared with other tire styles to keep the cost low. If there is a rim shown in the picture it is for display purposes only. Manufacturer warranties (when applicable). The tread is enriched with silica for balanced performance across all these conditions. Snow evacuation and grip in slushy and wet conditions is optimized by the directional tread design featuring an optimal amount of void ratio.